Impacts from Hurricane Florence to North Carolina wild oysters have been observed nearly coast wide. 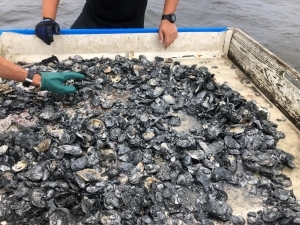 The North Carolina Division of Marine Fisheries (NCDMF) oyster management dredge sampling outside of the bays in Pamlico Sound revealed large areas of completely dead or areas of low density and primarily under legal size (less than 3-inch shell length) living oysters. Mechanical harvest for the 2018 – 2019 oyster season in Pamlico Sound was closed on Dec. 13 due to all four management areas within the sound having tripped the less than 26 percent legal size management trigger on at least two consecutive sampling events. This was the earliest closure to the mechanical harvest fishery since the implementation of this management tool. During October, dive surveys on Middle Grounds in Pamlico Sound, North Carolina State University (NCSU) researchers found only four live oysters out of approximately 20 quadrat samples excavated. They reported hypoxic and anoxic dissolved oxygen conditions and encountered numerous recently dead individuals, mostly new recruits. Additional observations by the NCSU team found that oyster reefs in the shallow bays were not as severely impacted as deep-water reefs with most locations exhibiting relatively low recent mortality. NCDMF cultch site selection work in October revealed limited evidence of recent mortality at shallow subtidal reef sites examined in Pamlico Sound and its tributaries and greater evidence of mortality was observed in Newport River. NCDMF collected samples both before and after Hurricane Florence from the Swan Island Oyster Sanctuary. A reduction in sublegal oysters, suggesting a mortality event, was observed post hurricane. However, there was also evidence of a strong recent spat recruitment to the site. 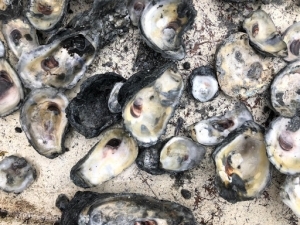 In the southern region of the state, significant oyster mortality associated with Hurricane Florence has been recorded and reported from areas including Stump Sound and the Cape Fear River. NCDMF sampling was conducted post-hurricane at a recently deployed artificial reef located in Carolina Beach State Park to assess oyster utilization. The material was consistently covered in spat that had grown to approximately .75 inches in length before all dying. The spat mortality is expected to have resulted from hurricane related water quality effects. The entirety of the Carolina Beach State Park Marina stretching to the Snow’s Cut Boat Ramp across from the Carolina Beach Inlet was observed to have 100 percent oyster mortality. This includes all oysters on marsh edges, bags and rock walls. This mortality event in the Cape Fear River is reported to extend down the entire estuary to the river mouth. Upcoming annual NCDMF spat sampling efforts will also reveal any impacts to cultch planting sites across the state. For more information, contact Joe Facendola with NCDMF at Joe.Facendola@ncdenr.gov. NCSU oyster dredge sampling in Pamlico Sound after Hurricane Florence. 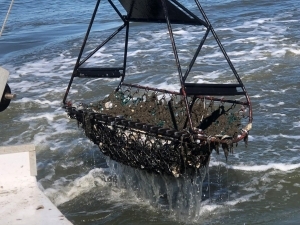 Dead oysters collected during NCSU dredge sampling in Pamlico Sound after Hurricane Florence. Evidence of recent mortality in oysters sampled from Pamlico Sound by NCSU after Hurricane Florence.